I was born in the 70s – so I still have memories of Vinyl Records. I also still have memories of Black and White TV. Our record player and Black and White TV did not retire till I was in High School. That was how durable the appliances were back then. Moreover – electric appliances were expensive – so people took good care of them. Today – I actually change MP3 players yearly – they’re not broken – it’s just that technology changes so fast – that the next generation of players – are so drool-worthy and I don’t have much self control – so I buy them. Do you still have Records from the old days that you wish could be loaded onto your MP3 Player? I spotted this device the other day while window shopping for a new gadget. 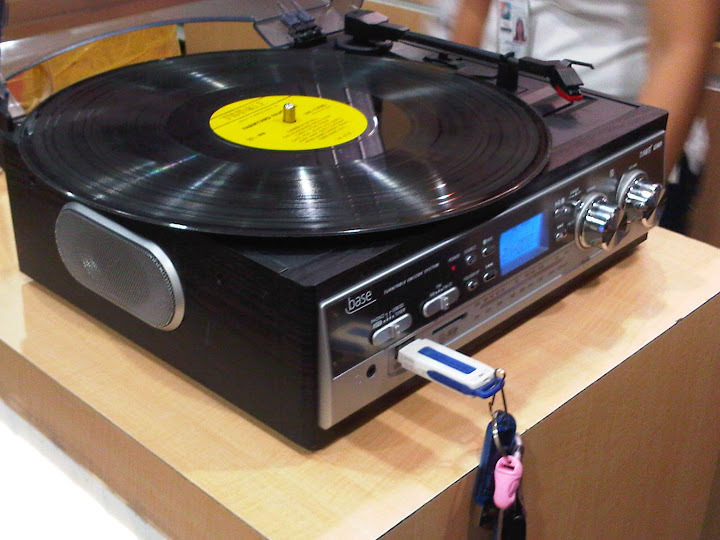 It’s a record player and if you plug a USB stick to it – the music from the record will be stored onto the USB stick. It was 40 USD ( 2,000 PHP ). I no longer have the Vinyl records – but I hear that somewhere in Evangelista st. in the City of Makati – they sell them for 2 cents ( 10 PHP ). Cool beans – don’t you think?